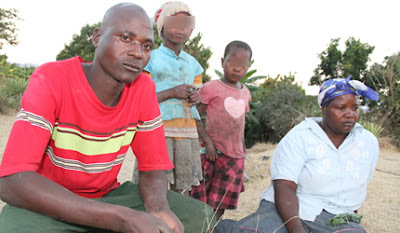 A married son has bedded and sired a child with his ailing father’s young wife in Mutoko. Zvikomborero Tome (35) said his 80-year-old father, Benny Muzunza who died last year, asked him to bed his wife, Joyce Katiyo (39), since he no longer had the energy. He said the pair eventually fell for each other and Joyce became pregnant. Their daughter is now three years old. His wife fled after discovering that the pair were sleeping together behind her back. Zvikomberero said it all started when his father confided in him that he was no longer able to s*xually satisfy his young wife in bed. He asked him to take over the conjugal duties for him. Initially, he said he refused but relented after pressure from the old man. He said the pair would sleep together in the bedroom with the full knowledge of his father. But a village elder said the two were lying about being given permission to sleep together. Fungai Chawora said Zvikomborero’s father used to complain to him many times about the relationship. Zvikomborero’s mother died in 1997 and his father married Joyce in 2005. Zvikomborero admitted that his wife left him. But he said this was not because he was sleeping with his step mother but because she had become ill.
Joyce said she was comfortable with the arrangement since she did not want to stray. “Zvikomborero’s father was my husband but he was old. He could not perform in bed and I was struggling since I am still young. He was afraid I would sleep with other men. That’s is why he suggested that I sleep with his son. So when he was alive I would leave him and go and spend the night with Zvikomborero. This went on until he passed away,” she said. But while the case shocked villagers it took a curious turn when the pair were hauled before Mutoko Magistrate Court. It was not clear what they were charged with but they were given community service which they are serving at the local clinic and hospital. The local chief reported them to the police. However, the pair said they had now stopped seeing each other as it was wrong.